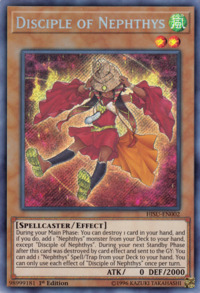 During your Main Phase: You can destroy 1 card in your hand, and if you do, add 1 “Nephthys” monster from your Deck to your hand, except “Disciple of Nephthys”. 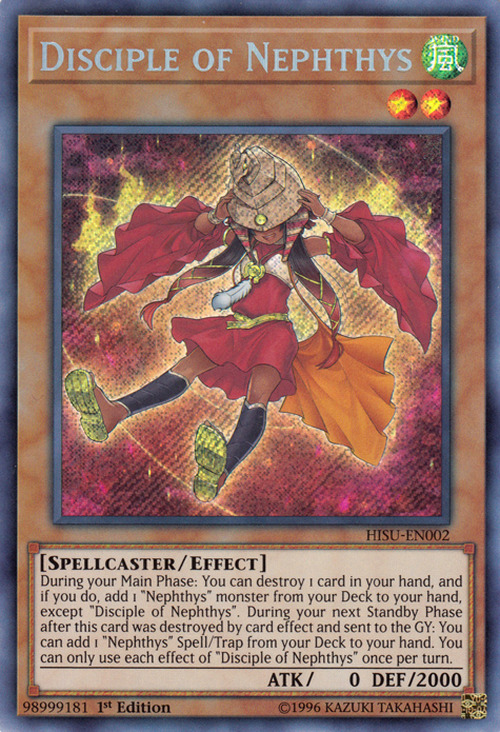 During the Standby Phase of your next turn after this card was destroyed by a card effect and sent to your GY: You can add 1 “Nephthys” Spell/Trap from your Deck to your hand. You can only use each effect of "Disciple of Nephthys" once per turn. This monster appears in the card artwork of Rebirth of Nephthys,Last Hope of Nephthys, and Awakening of Nephthys. She presumably is the young Hand of Nephthys.